Employing an innovative and comprehensive approach to civic education, SAR High School has designed rigorous programs for students, teachers, alumni, and parents. 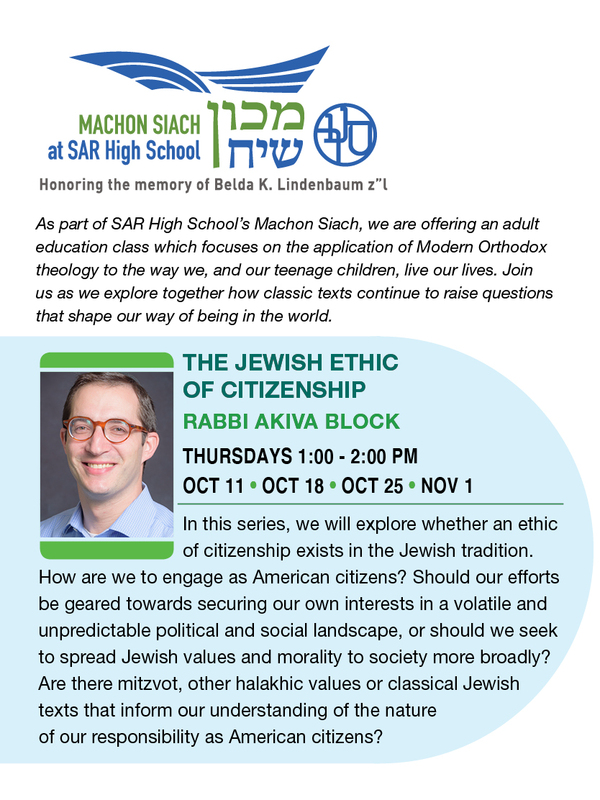 This past fall, Rabbi Akiva Block taught a 4-part series called “The Jewish Ethic of Citizenship” as part of SAR’s Machon Siach (“thinking institution”) Adult Education program. Participants in the course studied American and Jewish primary sources to explore how the Jewish tradition speaks to the responsibilities and opportunities of American citizenship. Read more about SAR’s Machon Siach and its Citizenship Cohort Fellows. Three of the fellows attended the Civic Spirit Summer 2018 Institute.